I wish I had read The Great Darkness Saga when it originally came out as single issues in 1983. I enjoyed the hardcover collection quite a bit, but the story was definitely written to be released as monthly installments at a time when collected editions were very few and far between, rather than the industry standard they are now. Most importantly, the major point of the story is the slow reveal (over nearly a year of monthly comics) that Darkseid is the mysterious figure lurking on a dead planet, masterminding a series of seemingly unconnected attacks in order to gather more power for himself. There are a few visual clues throughout the story that extremely astute readers might have been able to put together, but for the vast majority, Darkseid’s appearance in the final chapter would have been a shocking revelation, especially since this was published long before the age of advance solicitations and internet spoilers. Knowing that it’s Darkseid from the beginning does detract from the drama a bit, but there’s still a lot to enjoy about the book. 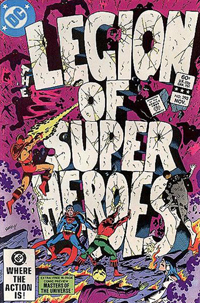 The long term character development, while very “soap opera” and fixated almost entirely on the Legionnaires’ various romantic pairings, is well thought out and fairly unusual for the time, especially given the book’s sheer number of regular characters. The artwork is dated in its style, but very well executed nonetheless, and the reprinting is sharp and crisp. The color, on the other hand, is excessively bright. Of course, superhero comics, especially older ones, are usually done in bright colors, but part of the reason for this was to combat the slightly yellow or grey tone of the newsprint they were printed on. When reprinted on slick, bright white paper the original color should have been muted a bit to compensate. Despite its minor failings, The Great Darkness Saga was an enjoyable read in a well put together package. And that new cover is just awesome.